NamesforLife semantic services provide scientific and technical publishers with standards-based editorial workflow solutions that enhance the value of content to readers while reducing the efforts of authors, peer-reviewers and editors to produce technically accurate content. NamesforLife has a booth at the SSP 2017 annual meeting this year. Stop by booth number TT7 for a demonstration of how our tools are being used by early adopters, how our approach might meet your needs for semantic enrichment of your content, and how you can help us shape forthcoming features. Our software architect, Charles Parker, and our founder, George Garrity will be available every day of the conference for questions and product demonstrations. Online tools have improved the efficiency of many parts of the editorial workflow, but also place pressure on publishers to perform new tasks in the service of authors and readers. These include identifying suitable editors and peer-reviewers and ensuring technical accuracy of published content. These tasks require a high level of domain knowledge that is often in short supply. 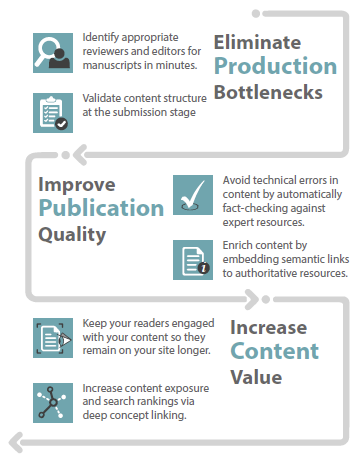 We offer services to fill these gaps that can be integrated into existing editorial platforms. [permalink] Posted May 31, 2017.